SlimChews™ Review: Revolutionary Weight Loss? Really? Home » Appetite Suppressants » SlimChews™ Review: Revolutionary Weight Loss? Really? 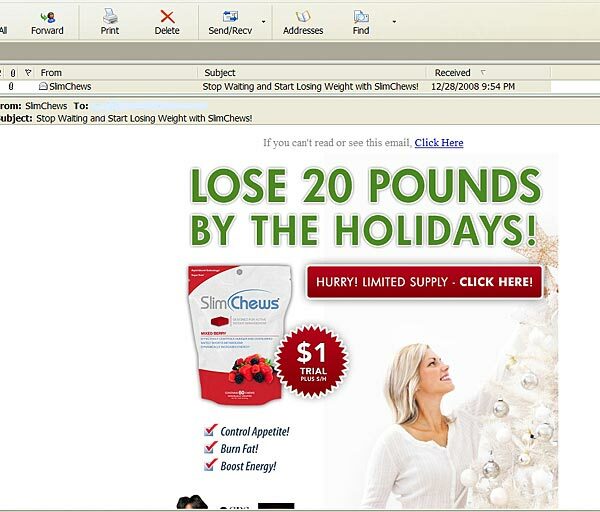 The first I heard about SlimChews™ was the other morning a when a piece of unsolicited bulk e-mail (aka “spam”) showed up in my mailbox (if you’ve received SlimChews™ spam, contact us and let us know!). I used the tracking software at eMailTrackerPro to try to determine the exact source of the mailing. Apparently it originated in or around Ontario, California. It was not misdirected, and was routed through the e-mail address [email protected] (information that is easily faked, so should be treated as conclusive). Why the interest in determining the source of the mailing? The retailers of this product. An affiliate of this product, who earns commissions on referred sales. A contracted third party whose job it is to send out mailings like this and disguise the source. Unfortunately, I cannot conclusively determine who sent this e-mail. At the worst, it is the retailer doing the mailings—which would be a severe blow to the credibility of any of their claims, and an insight into their business ethics. At the best, it is an affiliate who has sent this spam, and the company needs to take drastic action to ensure such mailings no longer occur. With that said, what are SlimChews™? Of course, in addition to these claims, you’ll also find the obligatory references to fact that the product is “scientifically tested” and “proven” effective, although no actual proof is offered to qualify this statement. Nor is the term “scientifically tested” actually defined. What this means in practical terms is a mystery to me. 1. Hoodia gordonii: One of the most hyped ingredients on the internet, Hoodia is a South African succulent (a plant of the cactus family) that apparently suppresses appetite, thanks to the miraculous P57 molecule. There are two problems with the Hoodia claims; first, there are no independently verified, peer-reviewed published studies that show it does anything of the sort, and two; Hoodia is an endangered species and takes a long time to cultivate. It is likely therefore, that most Hoodia products on the market do not contain any Hoodia at all. For more information on Hoodia, please read the full review here! 2. Brazilian Cha De Bugre: Described as a excellent weight loss aid and diuretic, there is exactly zero scientific evidence that this ingredient has any positive effects on weight loss. See the Cha de Bugre review for (a few) more details. The only way to try the product is to sign up for the “$1 Trial”—a recurring billing program that will charge you $43.95 for the “trial” packet (if you don’t cancel the trial and return the unused portion within 15 days from the date your product is shipped) and afterwards, continue to send you fresh product bill you accordingly each and every month. If you’re a regular visitor to UltimateFatBurner.com, you’ll know we are really, really, really not big fans of the practice of recurring billing, and especially of companies that go to great lengths to add customers to such programs without their explicit approval (check out this video for detailed information on the “free trial” scam). This washy language leaves the policy open to interpretation by the retailer. Do you simply need to cancel within the 15 day period? Or, as I just indicated, do they need to receive the product back within the 15 day period? Who knows? The long and the short of it is that this program is set up to rope customers into a recurring billing program by making it extremely difficult for anyone to cancel in accordance to the program policies. Although I haven’t yet received any feedback on this company’s billing policy, there is really no good reason to market any product in such a fashion. Couple this program with a product that contains two ingredients for which little real evidence of weight loss effectiveness exists, and you’ve got a product you shouldn’t touch with a ten-foot pole.